Easy to make, rich, decadent and full of berries. 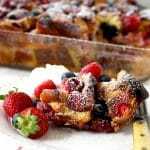 This Very Berry Bread Pudding is delicious and the perfect make ahead dish to enjoy for dessert, breakfast or brunch! How amazing is that? In a large mixing bowl, whisk the eggs with the sugar, add the heavy cream, milk and vanilla and whisk until well blended. In a small bowl, mix the berries. If using, add the liquor to the berries and let the mixture sit for about 10 minutes. Arrange the bread in a single layer in the baking dish, you will be using a little more than half the amount of bread at this point. Pour half of the custard mixture over the bread. Press lightly so the bread absorbs the custard. Spoon half the berry mixture (and their juices, if any) over the bread. Bake for about 1 hour or until set in the center and the top is just beginning to brown. Remove from the oven and let it cool for a few minutes before serving. Serve with whipped cream and garnish with extra berries (optional).